Roughly half of Americans (52%) say Barack Obama’s expression of support for gay marriage did not affect their opinion of the president. A quarter (25%) say they feel less favorably toward Obama because of this while 19% feel more favorably. There are wide partisan and age differences in reactions to Obama’s expression of support for gay marriage, according to the latest weekly survey by the Pew Research Center for the People & the Press, conducted May 10-13 among 1,003 adults. 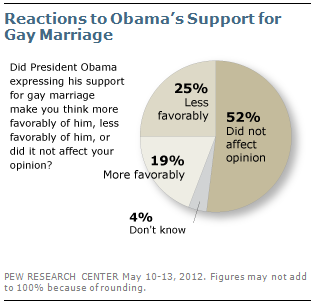 About half of Republicans (53%) say they feel less favorably toward Obama because of his support for gay marriage. 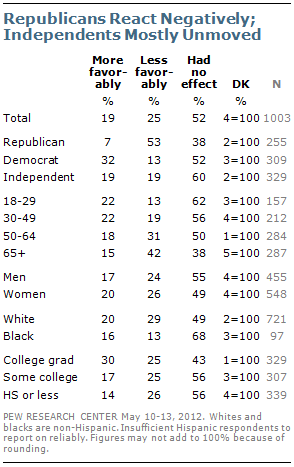 By contrast, 60% of independents and 52% of Democrats say their view of Obama has not changed. Among independents, as many say they feel less favorably as more favorably toward Obama as a result of his gay marriage decision (19% each). Far more Democrats say they feel more favorably than less favorably toward Obama (32% vs. 13%). Among those 65 and older, 42% say they feel less favorably toward Obama, while just 15% feel more favorably; 38% say their opinion of Obama is unchanged as a result of his expression of support for gay marriage. Among younger age groups, half or more – including 62% of those under 30 – say they opinion of Obama was unaffected by his gay marriage announcement. The opinions of whites largely reflect the population as a whole: 49% say Obama’s expression of support for gay marriage did not alter their opinion of the president. Among those who say it did, somewhat more say it made their view of him less favorable than more (29% vs. 20%). Most African Americans, on the other hand, say the announcement did not alter their opinion of Obama. About two-thirds (68%) say this, while about as many say it made them view Obama more favorably (16%) as less favorably (13%).